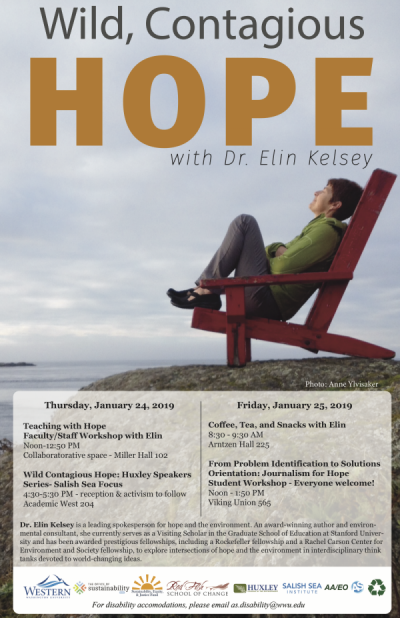 Elin Kelsey will visit WWU on Jan. 24-25 to share her work on environmental hope. Kelsey is a leading spokesperson for hope and the environment. An award-winning author and environmental consultant, she currently serves as a visiting scholar in the Graduate School of Education at Stanford University and has been awarded prestigious fellowships, including a Rockefeller fellowship and a Rachel Carson Center for Environment and Society fellowship, to explore intersections of hope and the environment in interdisciplinary think tanks devoted to world changing ideas. She will be leading multiple workshops during her two-day stay at Western. Kelsey is a welcome break from current environmental narratives which use language and examples that mostly evoke despair and terror. She artfully weaves together examples from her background as a marine ecologist, educator, and professional communicator to show how the resiliency of other species can help restore and spread hope to those around us. Whether your interests are social justice, the environment, or finding more hope in your life and work, Kelsey's workshops will inspire discussion and help shift your focus away from problems and towards the miraculous solutions that abound in our world. Kelsey specializes in environmental communications, marine ecology, and social sciences research in relationships to hope and appreciative inquiry. Her CV is can be found here. If you are interested in Kelsey coming to your class on Thursday afternoon or Friday morning, please coordinate with nick.stanger@wwu.edu. Limited space - so come early! Noon - 1:50 p.m. in Viking Union 565. Everyone welcome; light lunches provided. Students have been discussing the grief they feel about the state of the planet; their lack of awareness of environmental solutions that are working; and, their lack of knowledge about how to reorient their own research beyond problem analysis towards solutions generation and amplification. This workshop will be an exercise in solutions journalism which will workshop a pedagogical approach as a means to explore how to engage university students from a hope and solutions orientation when talking about our relations to Earth. These events are co-sponsored by the Office of Sustainability, the Sustainability, Equity & Justice Fund, Salish Sea Institute and the Redfish School of Change. More information about the events can be found here. More information about Elin can be found here.